John McCain’s millions in corrupt campaigns have been funded by “Arizona Grassroots Action PAC” (GAPAC) for years. 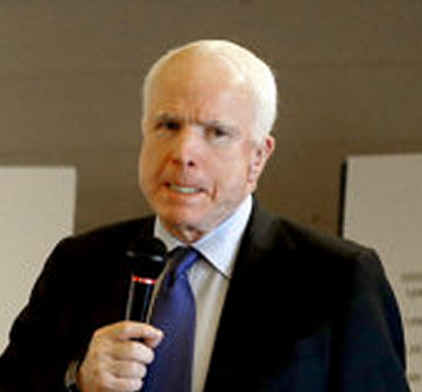 And Arizona (AZ) Senator McCain apparently thinks we (home-state Arizona Republican Constituents) are really stupid. Most of us voters are becoming aware many Senate Primary campaigns are exercises in casual contempt for the voters. And old frauds like McCain know they can easily win reelection by first diluting, and then smearing primary opposition. But now, as they smear Kelli Ward for McCain, AZ Grassroots Action PAC is wasting McCain millions on obvious lies. First, McCain’s PAC says Kelli Ward (a long-time Military Wife) is undermining our military. That is just plain stupid. Second, McCain’s PAC says Kelli Ward opposed bills funding our US military. That is impossible and fatally stupid. 1) Most AZ Republicans know Mike Ward is a serving Colonel in the AZ National Guard and former US Air Force officer. 2) We Voters all know Kelli Ward was a STATE SENATOR and could not ever vote on FEDERAL Military Spending Bills. McCain’s GAPAC thinks AZ Voters do not know the difference between State Lawmakers and US Federal Lawmakers. So GAPAC is now flooding Internet, TV radio and print with proof of McCain’s gross ineptitude and dishonesty. McCain’s AZ Grassroots Action PAC has bribed, purged, defrauded, threatened, lied and smeared many Republicans. In 2010 GAPAC paid off a decoy Republican’s mortgage and then smeared his real primary opponent, J.D.Hayworth. In 2014 GAPAC paid to purge hundreds of Republican Precinct Committeemen who had voted to censure John McCain. In 2015 GAPAC covered up fraud and dispersal of $50,000 stolen from Republicans at a Scottsdale resort by McCain-spoiler-Meluskey’s Campaign Director, PT Burton and two other Meluskey Campaign members, Bergman and Frewa. In 2016 GAPAC hired lawyers to sue an annoying McCain-Meluskey critic who was spreading the truth to AZ voters. In 2016 GAPAC is anonymously smearing Kelli Ward, distorting her record and insulting voters with ineptly obvious lies. John McCain’s AZ Grassroots Action PAC has done more damage to AZ Republicans than the AZ Democrats have done. But this year McCain’s sleazy Left Wing GAPAC screwed up badly and has probably cost him his 30-year Senate Seat. McCain hoped we voters wouldn’t notice. But we did. Sorry about repeating info from other reports, but this Grassroots Action PAC mistake will probably sink John McCain. So, In case some of your voter friends aren't paying full attention, spread the word about John McCain’s fatal screw up. When all our voter friends give a thought or two about McCain’s attempted smear… they will vote for Kelli Ward. Bill Heuisler, Marine Vet, Author of 3 books, former Tucson Cop and Arizona DPS licensed Investigator over thirty years. Another reason why it is best to vote for no politician - EVER. Sleaze is the government......... Period. Of course McCain is sleazy. He is a politician! McCain, your sins will find you out! As an ex Arizona voter I strongly endorse Kelli Ward and urge my family remaining in Ariz. to do the same. It's time this has been is put out to pasture.